The battle presently being fought in the streets and polling stations in towns and cities throughout Catalonia before, during and after October 1, in which a diverse civil society has come together in huge numbers, putting their bodies and knowledge in the service of the shared goal of defending what is considered to be real democracy, has also had a crucial battleground in the case of the Internet. On September 7, 2017, the Constitutional Court suspends the law of the referendum in Catalonia. Thenceforth, the Spanish government embarked on legal, police, and administrative persecution of any “device or instrument that is to be used for preparing or holding the referendum”, including ballot boxes and papers which were now criminal objects. Websites, apps and tools related with the referendum were closed on the Internet. Independently of whether one agrees or disagrees with the decision of the Spanish courts to ban the referendum, the closing of many regular Internet spaces can be viewed, in a great number of cases, as a grave violation of freedom of expression —and especially freedom of political opinion— which is protected in international treaties and by Article 11 of the European Union’s Charter of Fundamental Rights on “Freedom of expression and information”. While some websites, apps and domains belong to the Generalitat (Government) of Catalonia and were tools directly linked with organizing the referendum, many others were of private individuals or associations, and basically reflect political opinions. It is clear that one thing —arguable or not— is banning a referendum and quite another is blocking, while they were at it, the right to express one’s political opinion that the referendum should be held. In the last few days, Catalonia has been the testing ground of what we have always denounced or, in other words, the fact that the space of the Internet has yet again been subjected to a state of exception which “democratic” governments wouldn’t dare to apply to physical space because this violation of rights would immediately be visible. Proof of this is that many of the shut-down websites belong to associations with physical premises but no authority has risked ordering that these centers should be closed. Internet access is essential for the exercise of our freedoms and should be considered in itself a fundamental right [#KeepItOn]. On September 13 a court order shut down the web page referendum.cat. Thus began a game of cat-and-mouse between the Spanish government (with its state repression) and the Catalan government. Some citizens published the referendum web code in Github. After this, clones of the website began to appear, created by volunteer citizens in domains with names like piolin.cat (where piolin refers to Tweetie Pie, painted on the boat accommodating Spanish police), referendum.ninja o marianorajoy.cat, while alternative sites were also made available by the Generalitat itself. The police operation continues with domains being shut down and access blocked to all these sites as well as many other web pages with opinions about the referendum, including those of associations, sports clubs and private sites. All of this was occurring against a background of politicians being arrested and presidents of civil society associations being charged with sedition. In ten days more than 140 websites were blocked. The project OONI by Tor includes a non-exhaustive list of affected domains and information on the type of block. 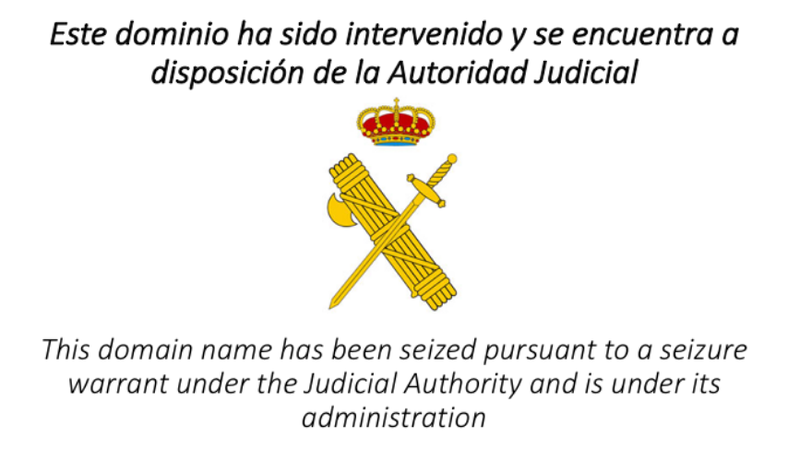 As part of this state operation, the Guardia Civil raided the headquarters of Top Level Domain .cat, confiscating IT equipment and data, and detaining one of its IT staff. This disproportionate measure, which is unprecedented in the European Union, implies the possibility of opening the way for something we have been struggling against for years, namely domain managers being held responsible for content. In this situation of persecution and very serious violation of rights, many people, moved by their convictions and without proper legal advice, have exposed themselves to risks which could have been avoided in some cases, and have left their identities at the mercy of a repressive apparatus that needs scapegoats to justify its actions. The open use of names among the alleged authors of the first mirror sites has meant that the authorities are now boasting that they have rounded up the young perpetrators (hasta 14). Some of them face very serious charges like “heading a seditious organization” which, as everyone knows, makes no sense at all in a free, open space like the Internet. These are definitely measures that aim to inflict disproportionate punishment so as to bully and intimidate citizens in an attempt to discourage their intense online activity. One of the most common errors made by citizens has been their frequent use of servers with few and poor legal guarantees for the client. A case in point is the insistent use of .cat domains. These come under the control of .es, and therefore the Spanish state, which shows no concern for civil rights, in contrast with other generic domains (.net, .org, .com…) with are overseen by ICANN and other organizations that do respect basic rights. The president of Catalonia, Carles Puigdemont—thanks also to help from experts who have actively and continually been engaged in working for the defense of rights (even people like Julian Assange and Peter Sunde publicly offered their counseling)—have recommended the use of proxies in social networks in order to gain access to blocked websites. He subsequently announced that IPFS had also been used as a distributed tool for housing the website giving citizens information about where they should go to vote. On September 23, the High Court of Justice of Catalonia ordered the “blocking of websites and domains [giving this information] which are publicized in any account or official social network of any kind” (). This was not just a matter of a specific list of sites but a general order giving a free hand to forces of security in ordering Internet providers to shut down websites. With these new powers, the Guardia Civil blocked the domain gateway.ipfs.io and thereby cut off connection, not only to the referendum website, but also to all content from the Spanish state hosted in IPFS through this gateway. The shutdown extended to websites of nongovernmental organizations and movements like empaperem.cat, assemblea.cat and webdelsi.cat which are in favor of the referendum. This carrying out of the court order also extended to GooglePlay, which was forced to withdraw the app allowing people to find information about where to vote. This networked action by means of which people have, for example, organized themselves, polling station by polling station, has also been manifest in physical spaces, for example with regard to protecting the ballot boxes from police seizure. For a month, the state security forces and their secret services have been searching all over Catalonia for the ballot boxes and voting papers. Although they have raided printers, media offices and headquarters of political parties and other organizations —sometimes without a court order— the ballot boxes were never found, yet they magically appeared in the polling stations. The ballot boxes and papers were there—they were everywhere—guarded by small groups, autonomous nodes, and spread all around Catalonia. Finally, even as the referendum was taking place on October 1, the Spanish government tried to block, by every means it could, the possibility of accessing the “universal census” app of the entire electoral register. The domain registremeses.com where the app was hosted was immediately blocked. The Generalitat quickly supplied the more than 1,000 polling stations throughout Catalonia with alternative IPs for access. We believe that, in this case, it probably would have been better to work with Hidden Service in order to avoid police harassment and DDoS attacks by groups opposing the referendum. However, the polling stations still managed to function, almost all of them routing the smartphones of the volunteers in order to access the Internet. In the street, people were chorusing “airplane mode” so as to save network bandwidth for people working inside the polling stations. The operation lasted from 5 a.m.—which is when citizens began filling the streets to protect the polling stations—until midnight when the vote count ended. All this was achieved in the midst of violent charges by National Police with a toll of more than 800 wounded. Despite everything, more than 2,200,000 people came out to vote. The citizens and government of Catalonia have learned and are witnesses to the fact that in the front line of defense of our democracy, digital resistance depends on our use of technological tools which allow us to protect our rights autonomously and in a well distributed manner. We hope that the Catalan government will never forget this and that its administration will always resist the temptation of the usual kind of discourse that criminalizes tools protecting privacy, encryption and decentralization of the Internet. Moreover, when repression was massively unleashed in streets and villages of Catalonia, the social networks and their intelligent use by citizens were once again used to put an end to the blocking and manipulation of information by the mainstream media in Spain, and to let the international media outlets know what was really happening. Perhaps in 2017, many people were already used to this, but it is also highly possible that there have never been so many published videos and photographs documenting police violence as there have been this time (https://twitter.com/joncstone/status/914450692416397312). Without the widespread use of social networks to testify and inform, the people of Catalonia would have been totally isolated and crushed with absolute impunity. From this point of view, what has been happening in the last few days is historic. This acceleration towards a greater degree of democracy and more power in civil society is happening spontaneously but the ignorance of most people about some aspects of the digital milieu is exposing them to risks and, in this regard, this is what we must make and what we are putting evey effort into to achieve. On October 1, 2017 the politicians were nowhere to be seen. Only Unidos Podemos could be heard now-and-then, trying to capitalize on our wounded for its own ends. Apart this, there were only grassroots people organizing and acting, including some members of parliament and councilors who are people like anyone else. Over 24 hours, civil society came together to work for a day in which people could vote and vote on a huge scale and, furthermore, it didn’t fall into the temptation of responding to the state’s provocation in the form of violence, even though hundreds of injured people needed medical attention. There was happiness, anger and fraternity among the most different people. It was incredibly moving. There were no slogans, no shouting, so that people could vote without being coerced in this display of a valiant, stirring capacity for organization and desire for democracy. On October 1, 2017 we proved that order is the people and disorder is this state. *Front picture by @Makrakas in Gràcia, Barcelona. The legal basis in Catalonia comes from the https://en.wikipedia.org/wiki/Parliament_of_Catalonia and several laws approved such as: https://en.wikipedia.org/wiki/Law_on_the_Referendum_on_Self-determination_of_Catalonia and the https://en.wikipedia.org/wiki/Law_of_juridical_transition_and_foundation_of_the_Republic. Replicas of this web site were hosted in Cloudflare, but then ISPs were ordered filters or redirections. The site was published in a code repository and replicated in the P2P file system IPFS. A IPFS gateway was blocked in some ISPs, but content was accessible from IPFS clients. Among many others (more than 140) sites, such as assemblea.cat, blocked (different ways depending the ISP) and moved to assemblea.eu. The day of the election many schools and poll stations found their Internet connection down. Police closed several poll stations, in several cases with violence, and a small portion of votes were seized by the police. Citizens deployed their own mobile and wifi point-to-point links, even batteries for power to allow access to the census application to provide guarantees to the process, such as avoid double voting. VPNs, indirection mechanisms such as Onion routing and alternative ISPs were used to circumvent the traffic filters. The census service itself, was stopped the day before with a judicial order, among nearly 30 databases, controlled from the data center of the Catalan government. Replicas were created. These servers were actively blocked and attacked during the day, and some of the interruptions and delays of the voting process were the result of that, and required moving the servers to new IP addressed. People in poll stations were using a web application to use that service for voter validation, and social media was used to share news about changes and events. Many people resorted to Whatsapp, Telegram, Signal groups, Twitter, etc. Many, diverse, and powerful DDOS attacks have happened to many web sites related to the process in the last weeks. This is still ongoing. Today there is a general strike in Catalonia.